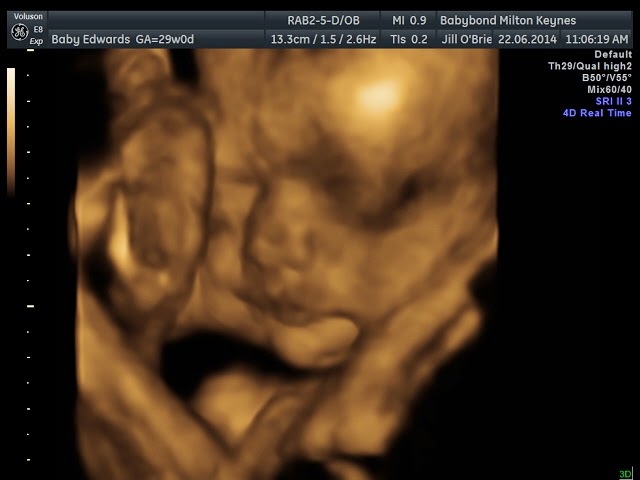 Just before we went away on holiday, We had a 4D scan. As you may or may not know we previously paid for a Gender scan to be done privately (you can read the post here). We both wanted a 4D scan and decided that we would have one with the same company who previously scanned us, and I'm glad we did. It was completely the right decision. The sonographer (Jill) was the same lady we had before. Which was a nice little touch I was not expecting to be as amazed as I was, or as emotional come to think of it. When I saw her on the screen I wanted to cry, our previous scan was amazing don't get me wrong, but it was nothing compared to this one. Her features are obviously fully formed at this stage so you could see her eyes, her mouth and her little nose. We even saw that she had a little bit of hair! She was laying with her feet resting on her head, I'm not too sure how that is comfortable, but she wouldn't budge so it must have been. At one point during the scan, you could see her trying to eat her feet. I think she is definitely going to be a flexible baby. It's hard to explain but it has made me feel so much closer to the baby. I mean I know she is my baby, but seeing her on the screen just confirmed it, seeing the faces she was pulling during the scan. We're just like the ones I pull as strange as that sounds. It's like she has her own little personality already. 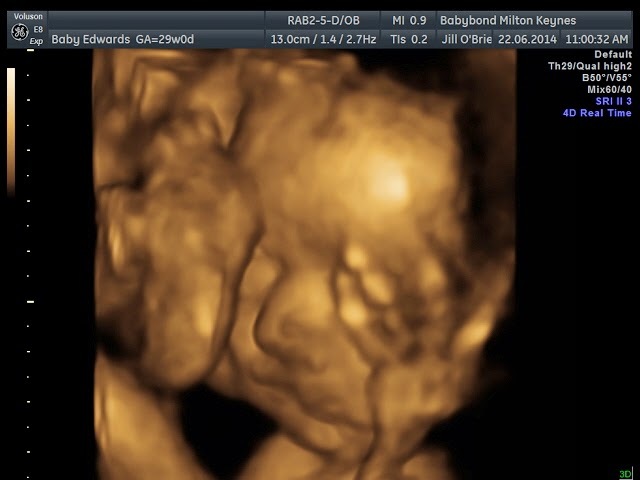 Both I and the sonographer agreed that she looked just like her daddy, Although he isn't convinced that it is true. When I showed his Mum and Nan the scan photographs they said they could see the resemblance of him in them. Actually pretty much everyone who has seen them said that she looks like him. We also purchased the scan on DVD, It is nice to be able to watch it back, and I can't wait until she is older to be able to show her. 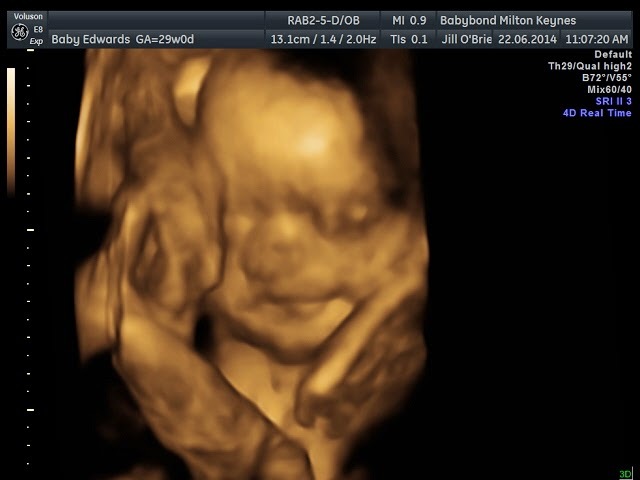 Come to think of it, I can't wait till she is born to see if she looks like she did in the scan. DVD recording of the scan in a sleeve with your choice of white, pink or blue babybond bag, to take home. We also purchased the USB with all of her pictures (for extra on top of the package). Which I would recommend to other people because these scan pictures tend to fade if they are in the sunlight. If you want to book a scan with them, you can find your nearest clinic on the website. 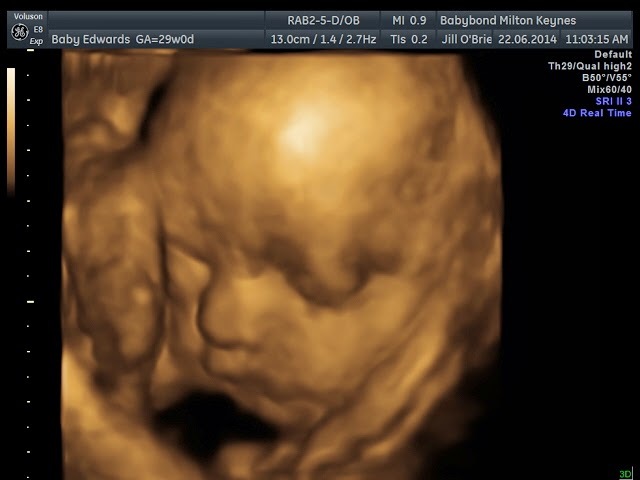 I would honestly recommend having one of these 4D scans, It has definitely made me feel closer to Baby E, and I personally think that having it on DVD is a lovely keepsake, which I intend to show Baby E when she is older. It was also nice to be able to show my family, and it kept them involved. The best reaction we got was from my Nanna. It is her first great-grandchild, and she is very excited about it. When we played the DVD to her she actually cried, it was so sweet. This was a little quote from her. "In my day, we didn't have all this technology. We couldn't even find out if it was a little boy or a little girl. Watching this just makes me want to hold her"
I hope you enjoyed this, and I would love to know if anyone else had a 4D scan and there reactions/opinions of it. Leave it below in the comments for me. 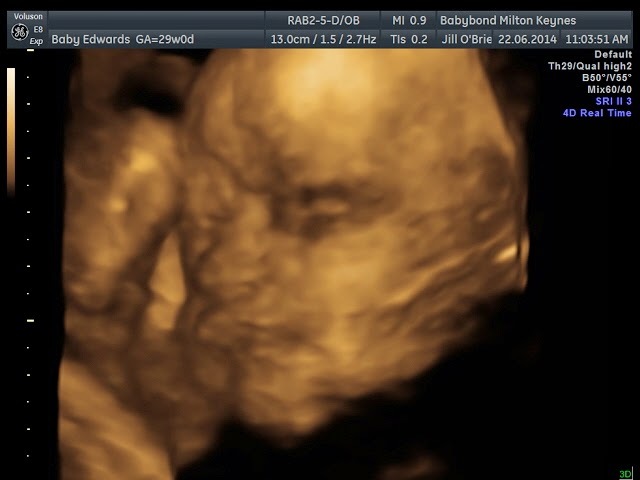 Awww so lovely :) We used BabyBond for our gender scan and they were great. 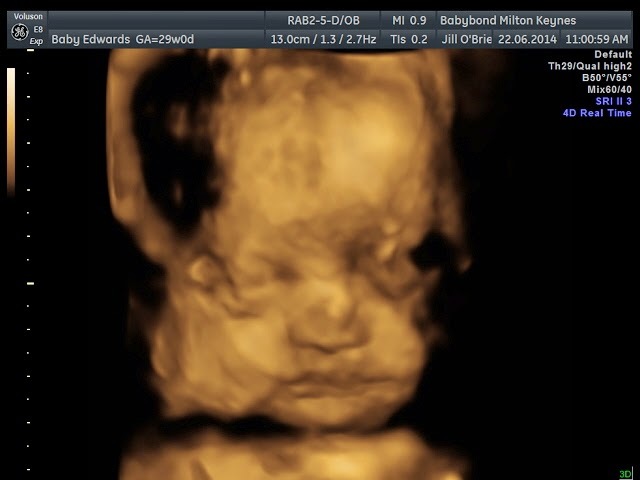 We also had a 4D scan through another company which was nice too. I didn't think our son looked at all like he did on the scan photos once we he was born though lol. They're weird to look back on now....I can't believe its the same baby! They're amazing aren't they!! We recently had a HD Live scan, which is the next one up from 4D, it was so so clear it was amazing!! Good luck with the rest of your pregnancy! !